Hello to all you crafters! Today's card was made for a challenge at Joan's Touch. It called for using the colors of green and white, an embossing folder (inking inside optional), and an oval. The photo above was taken in a different setting than I usually do so the white panels/layers look cream colored but they are actually white card stock. I used Christmas pine card stock (we still have snow here, albeit slowly melting) from GKD for my base card and added a white layer. 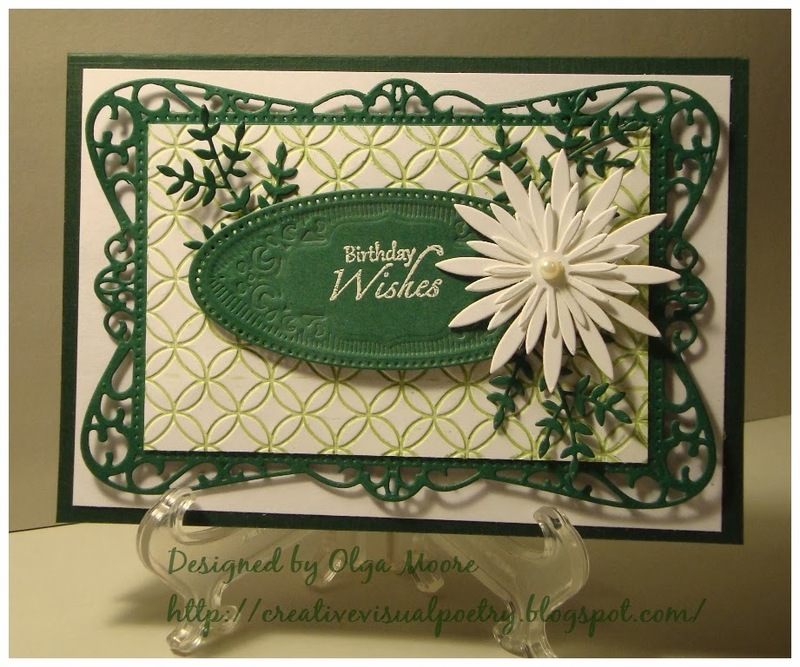 I cut and embossed a frame in green using a Spellbinders Timeless Rectangles die. Next, I inked the raised side of the inside of a Darice Interlocking Circles embossing folder with GKD Grass Green ink and then embossed a white panel in the folder. This was then adhered to the green frame and popped on to the base with dimensionals. The green oval was cut and embossed with Spellbinders Radiant Rectangles dies. The sentiment, from GKD Elegant Florals, was stamped in Versamark and then heat embossed with white EP. I popped it onto the framed panel with dimensionals. The flower, cut from HFC Delicate Asters dies, and the leafy sprigs, from Poppy Stamps die, were added to complete the project. As a final touch, I added a white pearl to the center of the aster. Hope you enjoyed this post and thanks for visiting! Olga, your card is out-of-the-ballpark beautiful. The artistry is exquisite, and I love that Spellbinder's frame that you used. So elegant! You have created a masterpiece for Joan's challenge this week. Olga, Your card is so beautiful! I love your flower! Hi Olga! Thank you for sharing this absolutely STUNNING card in our challenge this week. All the cards you create are lovely, and I'm so grateful to have you share them with us at Word Art Wednesday. You are doing such awesome work. I adore this card and what a beautiful aster you created to grace it. This is just beautiful. Thank you so much for joining our "anything goes" challenge at Word Art Wednesday. We appreciate your support and your wonderful inspirational creation. Hope you will join us next week too. Olga this is just so delicately beautiful!! Love those flowers! Thanks so much for playing with us at Mod Squad! This is so beautiful and elegant...Love all the embossing and inking as well as the die-cut shapes. Well balanced creation...Love it a lot! Thanks for joining the fun at our neighborhood---613 Avenue Create! God bless, always! Olga, this card is beautiful. I love how you did the oval and your embossing background really sets it of. Great job!! Thanks for again joining us at Joan's Touch for this week's challenge. I am your newest follower! I just love your style! Thanks for playing with us at Loves Rubberstamps! Olga, congratulations on winning the challenge at Joan's Touch. Your card is so beautiful. You are a true artist! Thank you so much for all your lovely comments. I so appreciate every single one of them. I am fortunate to have met so many exceptionally talented crafters through the challenges that I have participated in. Wow, this is so beautiful. Thanks for playing with us over at Loves Rubberstamps!!! Beautifully laid out card - love the flower and branch die cuts. Thank you for joining the Crafty Girls challenge, hope to see you again soon.